Mandala is a Sanskrit word meaning center and circle. It conveys the notion that any center is tied to its circumference and any circumference is always determined by its center. Together they represent wholeness. Examples of mandalas abound in nature. Every cell in our body, for instance, is a living mandala. So is the iris of our eye, a snow crystal, a bird's nest, a bicycle wheel, and Planet Earth herself. Mandalas have been known to all cultures throughout history. Individual designs vary greatly but they always have the following characteristics: a center, cardinal points that can be contained in a circle, and usually some form of symmetry. They can be very simple or extremely complex as in ancient Tibetan religious designs, Navajo sand paintings, and huge stained glass windows in medieval cathedrals. The 66 mandalas in Everyone’s Mandala Coloring Books Volumes 1, 2 & 3 (22 designs/book) were drawn by Monique Mandali, who is also a transpersonal psychotherapist. In the preface of her third coloring book, Monique writes about her personal journey with mandalas, Tibetan monks, and her breast cancer diagnosis on the winter solstice of 1993. The 25 mandalas in her fourth volume, Peace Mandala Coloring Book from Children around the World, were designed by girls and boys ages 6-15 from several countries "to help spread seed of harmony for the next 1000 years". Monique edited their designs to fit the format of her previous coloring books and wrote about these remarkable children in the preface. We invite you to explore the magic of coloring mandalas! 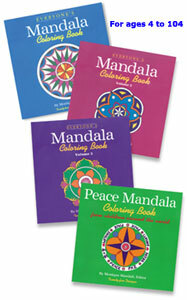 Monique Mandali’s four mandala coloring books have a suggested retail price of $9.95 but many online vendors offer discounts. Our mandala coloring books as well as beautiful mandala meditation banners are available through our MANDALA CONNECTIONS store at www.amazon.com. Are you curious about us? We invite you to read Mandali Publishing's unusual story.